DMCA stands for The Digital Millennium Copyright Act. A DMCA takedown notice is a notification to a company (generally a website or search engine), that they are either hosting or linking to copyright-infringing material. It provides them notice to remove the copyrighted content. Once you become an established cam model and have more people viewing your content, you’ll inevitably come across your content on sites that you do not want it distributed on. This could include tube sites, clip sites, forums, etc. Contacting the webmaster yourself can sometimes work to get your content removed, but not always. Not only does it not always work, but it can be very time consuming. There are sites out there that will do all of the work for you. Many of these sites have different plan levels for you to choose from. With the cheaper plans, you have to find the pirated content yourself and then they will handle the takedown. With plans that cost a bit more money, they will handle absolutely everything for you, including finding the pirated content on search engines, tube sites, and even social media and then going through the steps to have it removed. Having stolen content of yours distributed on various sites throughout the internet can possibly take away income from you. If it can be watched for free, some people might not pay for an official copy through you. Not only that, but it can also be a security risk. If you use regional blocking to block specific countries, states/provinces, zip codes, etc. from viewing your content, all of those regions will be able to access it from the pirated location. It’s also important to check with the current cam site you are working with. Webcam sites like Naked.com for instance, offer free dmca takedowns for all their models, this is a huge savings in my opinion. Not only can their service help while you’re currently in the industry, but it’s great for retired cam models as well to prevent family members, coworkers, potential employers, and friends from finding out what you used to do. 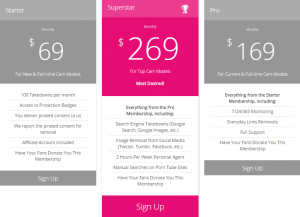 If you’re unsure about Cam Model Protection, they offer a free trial membership. You’ll have full access to all of their features so you can test them out and see if it’s right for you. You can even have your fans donate towards your monthly fee! You can also use dmca.com for your takedowns. They only charge $10/month, but you pay per takedown. Each takedown costs $199. So depending on the amount of takedowns per month, Cam Model Protection will probably be the best option. Sometimes you may find your content online, but a DMCA takedown isn’t always the best solution. A site like Live Cam Clips is a good example of this. If you want your content completely removed, they will do it for you. But whenever someone submits one of your live cam shows to their site, they always put a link back to your camming profile. If that isn’t enough for you, or if you feel like too many of your clips are being shared for free, they offer another solution. You can submit one or even a few cam shows that you choose and edit down yourself (they can be teasers that stop when things start to get intense, or even a full cam show). Whenever someone submits one of your cam shows to their site, instead of posting the video that was submitted, they will post the video(s) that you sent them. This is a great way to get extra exposure without all of your cam shows getting leaked. Previous postWhat Is Miss MyFreeCams?